Five-month-old Maverick decided that he wanted to eat a rock for fun. Well $2,700.00 dollars later he is doing just fine. 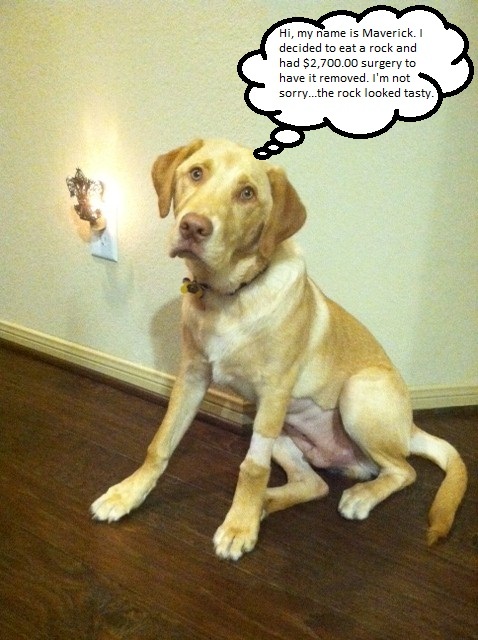 Aw Maverick, Sadie ate a tennis ball and cost her parents $1200. Make sue you say thank you to you parents. Ah, we can one up ya kiddo–$3600 for swallowing the end of a dental chew! Wow! I guess I should be grateful for only spending $600 on a eaten rubber ball. Admit it … there must have been at least one time you said, “Would you like that on the rocks?” What else could Maverick do, but wait for his opportunity?! Is it just me, or is that wall outlet on FIRE?